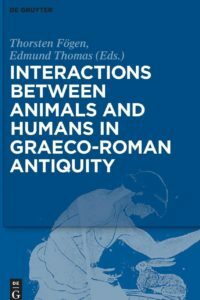 The seventeen contributions to this volume, written by leading experts, show that animals and humans in Graeco-Roman antiquity are interconnected on a variety of different levels and that their encounters and interactions often result from their belonging to the same structures, ‘networks’ and communities or at least from finding themselves together in a certain setting, context or environment – wittingly or unwittingly. Papers explore the concrete categories of interaction between animals and humans that can be identified, in what contexts they occur, and what types of evidence can be productively used to examine the concept of interactions. Articles in this volume take into account literary, visual, and other types of evidence. A comprehensive research bibliography is also provided.